This is the part of the web site that I should tell you a little about myself. Where I am from, what I have done with my life and some of my points of view about fishing. So here goes the short version. I was born in St. Petersburg, Florida during the late sixties. Since then I have lived in Ft. Myers, Florida, Cape Hatteras NC and The Florida Keys south of the Seven Mile bridge. My father was an avid diver, waterman and adventurer. From a young age started me out the same way. I was scuba diving by 9 years old, competitively spearing fish by 16 and driving boats for money by 17. I knew at 13 I would be on the water for whatever it was I would do. In High School I was voted most likely to become a race boat driver or drug runner. Fishing was always a passion for me be it above or below the water.. I joined the Coast Guard right out of High School and they had me going out when others were coming in. Heavy weather is something I got accustomed to quickly and it was my job in uniform. On my off time in Hatteras I surfed mostly learning more about the Ocean than ever written in a book. Working water sports jobs from teen to adult. A dive master since 1991. I ran dive boats for the state of Florida Parks and privately owned dive shops both in the Florida Keys and St. Pete. while I honed my skills as a commercial and competitive spear fisherman, hook and line commercial fisherman and lobster harvesting diver. 1993 my diving career was halted by a brutal attack from a barracuda to my right leg while free diving near Marathon. It was time to take another approach to earn my living. I bought my first flats boat that winter and studied the art of flats fishing while working watersports jobs and moving away from diving. I knew then that this was my career choice. By 1995 I had a full time schedule of 240 flats fishing trips a year That were obtained from local concierges and fly fishing shops. 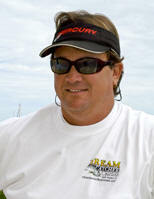 By 1996 my anglers and I won our first celebrity championship in the Redbone tournament here in Key West. Since then in my flats fishing career My anglers and I have won over 30 awards from that series and awards from several others. In 1998 Dream Catchers was a two boat operation with he purchase of my 28' center console that we would use for dolphin watching, sight seeing and light fishing. The numbers grew both in popularity of Dream Catcher but also in people wanting more in a charter service. I was consistently raising the bar with new boats and the latest technology from Mercury outboards. In 2003 my wife Gennifer (Island Genn) and I tried to form an organization of local fishing guides that would be like minded in their approach to guiding. A standard of sorts. We called it the Lower Keys Guides Association. 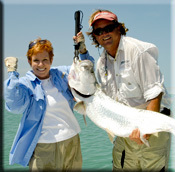 At that time we were bringing over 2000 fishing charters to Key West from our web sites and promotional efforts. We wanted to make sure the guides we were promoting were offering the same level of service that I was offering to my clients. The idea was also to gain membership to increase our voice, get group health insurance and market ourselves as a group. This failed miserably not by lack of participation but by lack of desire to run a better charter service. So I took another route. In 2003 I bought boats and hired guides for fishing. A notion that did not sit well with the local guide population. I learned that if a fishing guide does not have to worry about marketing, boat payments, insurance or the headaches of break downs - he could focus on his customer service, his fishing skills and become the best guide out there un-distracted A real job of sorts without all the burn out syndromes that come with being an independent. It worked..
Today I still own Dream Catcher Charters and it is bigger than life. 2011 was our biggest year ever and we doubled our schedule out to other fishing guides that keep to our standards. The fishing guides that work for Dream Catchers are amazing men that I respect as colleagues. A full time guide here fishes over 300 trips a year. We have many alumni that we use for our overflow because we know they are up to the standards. We have made many friends along the way using our time on the water, credibility and visibility to promote and improve their products. Mercury Marine, Mercury Racing, Yellowfin Yachts, Daiwa, Calcutta, Owner Hooks and MirroLure. My competitors like to share with clients that are shopping for a fishing charter that I, (Capt. Steven) do not run fishing charters anymore.. They will tell them, "If you book with Steve you will get one of his guides and not him".. Well, that's true if you want to fish with one of the talented fishing guides of Dream Catcher Charters. But.. If the confirmation that we send to you to sign for your reservations with us has MY name on it, I guarantee you will get my smiling face on the boat, Like it or not... There is no bait and switch here. We tell it like it is and we don't want a surprise at the dock any more than you do. I don't fish every day anymore. In fact I like to take most Saturdays and Sundays off with a few exceptions keeping my schedule to about 3 -5 trips a week, weather permitting. I stay in the loop by working with the guys that fish for Dream Catchers. They are out there two trips a day finding fish. We communicate.. If I am not available AND you don't want to fish with the guides of Dream Catcher Charters.. Tell US>.. we will hook you up with any of the other talented independent fishing guides of Key West that are offering a fishing charter that you can and will enjoy. People I would Like to thank. For every person there are the people who saw their potential and did somthing that helped them along the way. These folks helped me with my journey, they either taught me something, opened a door or lent a hand with nothing asked in return. Served in the United States Coast Guard Specializing In Heavy Weather Search and Rescue Cape Hatteras Operating the 44 UTM. South Atlantic Reef, HMS, Coastal, and Pelagic Federal Permits Holder. Mercury Redbone Key West S.L.A.M. Redbone Little Palm Island Grand S.L.A.M. I have been dedicated in supporting The Mercury Redbone series of Tournaments to find the cure for Cystic Fibrosis Since 1996. Not only is it a great event here in Key West but also a fun time to get together with some of the best fishing guides in the world.